Essex Primary School has worked hard to create a scheme of work that supports, stimulates and challenges the ASD children in our care. Throughout the RP curriculum, pupils are encouraged to make choices, develop use of communication aids, and practice such social skills as group interaction and turn-taking. We understand that each child has different needs, and these are taken into account when planning for their curriculum. However, all children attend teacher-led sessions, participate in lessons in their mainstream class, and take part in assemblies and performances as far as they are able. The aim of Life Skills sessions is to develop pupils’ independence in daily life activities, such as brushing teeth, face washing, combing/brushing hair, and receiving hand or foot massages to aid relaxation. We also role-play shopping trips to practise the exchange of money for goods. In these sessions, pupils are made aware of hygiene routines. They wash their hands before beginning food preparation, which leads on to such skills as cutting, peeling, mixing and rolling. Our pupils enjoy eating the food they prepare: because of this, we make sure we work with a range of different tastes and textures. Finally, at the end of each session, pupils help with tidying up by washing dishes and cleaning tables. 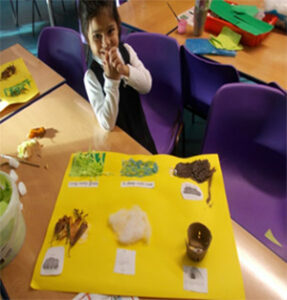 Our science topics include light and dark; heavy and light; sinking and floating; and planting, where the children can participate in the practical care of plants. 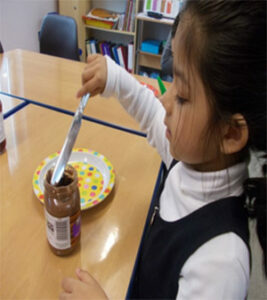 These sessions are designed to be hands-on, and encourage the children to manipulate a range of resources. Attention Autism sessions focus on developing attention and listening skills. An attention bucket, full of high-interest and exciting toys and gadgets, is used to motivate the children to practise their focus. These sessions take place in our dedicated Sensory Room, which is equipped with a range of resources to stimulating and soothe. 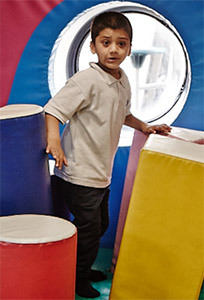 In their lessons, children explore a variety of resources to focus on a sense; for example, we explore ‘touch’ by providing different media for the children to introduce to a variety of surfaces, and for ‘sound’ we link music to the individual sounds of sensory objects to relax or alert pupils. These sessions are linked to the topic book currently being used in the Resourced Provision. The aim of these sessions is for children to become more confident with, and in, water. We travel to a local leisure centre, which encourages children to become comfortable with a new routine and setting. Once inside, pupils are supported in their enjoyment of water-based activities, including lessons on how to float or swim. We take pupils on trips to the shops as part of their Life Skills education. This activity encourages the children to follow directions, become familiar with new places and activities, and to be more confident when travelling by public transport. In the shops, children have the opportunity to practise money-handling and transaction making.